Tartan plaid is simply a pattern of thread repeated in both the breadth and width of the finished fabric, the woof and the warp. A true plaid, then, has the same pattern when you rotate it 90 degrees. But tartan plaid is also something more, one of the few surviving cultural reminders of the independent Scottish nation. In fact, the tartan is so fundamental to the Scottish identity that English authorities banned wearing plaid after the Scottish rebellion of 1746. Many Americans can trace their ancestry to Scots who were sentenced to seven years labor in the colonies for wearing their tartan. As early as the Roman conquest of Britain in Julius Ceaser's day, the Celts of Scotland and Ireland wore primitive tartans. At the time, tartan referred to a style of weaving fabric that makes a fine, diagonal texture. Look at your jeans or a twill shirt; you'll see the fine diagonal pattern. This strong weave is made by sewing the thread over two, under two instead of the simpler over one, under one. During the Middle Ages, Scottish weavers began using simple, natural dyes to create plaid designs in their tartans. There was little standardization of patterns, with weavers creating a new design for every bolt of fabric. But regional styles began to develop, based on local tastes and the availability of natural pigments. Eventually, clans began to wear a more standardized set of plaids, but there was still much variation among tartans. In fact, Highland warriors identified their clan affiliation mainly by devices on their hats, not the pattern of their kilts. Thanks to the early Industrial Revolution, weaving became a cottage industry. Weavers could make large quantities of fabric with standard designs. This helped spur greater standardization of tartans and stronger clan identification with a single plaid pattern. In 1707, Scottish nobles dissolved the Scottish parliament and signed the Act of Union with Great Britain. Scottish resentment boiled over in 1745 with a revolt meant to expel English authorities and install Bonnie Prince Charlie, the last Stuart prince, as King of Scotland. The Jacobite revolt collapsed after a military defeat at Culloden, and English authorities clamped down on Scottish nationalism by banning the kilt and the tartan. Up to this time, the main form of the kilt had been the Feileadh Mor or Great Plaid. This was a blanket-like piece of plaid about five feet tall by 4.5 or six yards wide. Highlanders pleated the width of the fabric, secured it around their waist with a belt and carried the bulk of the garment over their shoulders. This toga-like garment could be worn like a cool pair of shorts or around one's shoulders and head like a winter cloak. The distinctive tartan weave made kilts more water resistant than other clothes and faster to dry when wet. The Great Plaid could be used as a blanket at night or as a makeshift shelter while on the march. By the 1790s, the English aristocracy had discovered Scottish culture as a romantic diversion and ended the ban on tartan. The tartan revival was accompanied by the introduction of the short plaid kilt worn today. The most common origin story for the short plaid is that it was designed by an English factory foreman who wanted his Scottish workers to be able to move more freely -- and therefore to be more productive. Perhaps. But the skirt-only kilt became the standard, and today is what we mean when we say kilt. And in the tartan revival of the late 18th and 19th centuries, the nominal clan chiefs began to choose particular tartans as the standardized symbol of their family identity. 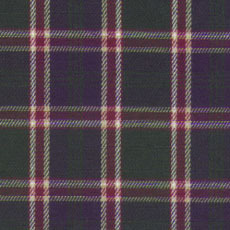 Today there are an intimidating 2,500 registered tartans, ranging from the family plaid of Clan McDonald to plaids for soccer teams, the Royal Canadian Air Force, the West Point corps of cadets and even a commemorative plaid for the U.S. bicentennial (the logo at top incorporates the red, white, blue and black U.S. bicentennial plaid and the gray, black and gold West Point tartan). But the basic rule of tartan is that there is no rule; anyone can wear whatever plaid he prefers. Below are scans of the plaids I use to make my kilts. 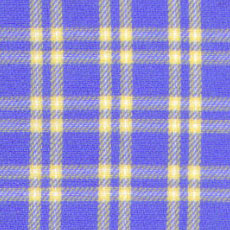 Scottish tartans tend to use large, bold designs. Large, bold designs are bad for 12" Joes; if you simply used a bolt of real kilt tartan the plaid pattern might only repeat once as it circled Joe's legs. Instead, the best fabrics I've found have been in men's shirts, where small-pattern plaids are common. That's what I use. If you're making your own kilt, I recommend scouring the clearance rack of a discount clothier, like Marshall's or Filene's Basement. And look for "big and tall" shirts; an XXL shirt yields a lot more usable fabric than a size L. A lot more. William Wallace This plaid reflects traditional tartan styles, using earth tones that harken to the homespun origins of tartain plaid. If your Joe has the urge to paint his face blue, or if they can take your life but not your freedom, this is the pattern for you. Rob Roy MacGregor This plaid shows the more colorful developments of the 17th and early 18th centuries, during the glory days of the Highland clan system. If your Joe aspires to be an outlaw folk hero who puts loyalty to friends and family before obedience to a far-off king, this is your plaid. 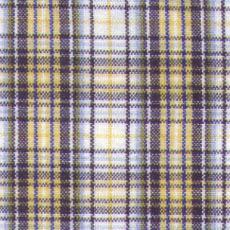 Lachlan MacRae This plaid incorporates the more complex colors and patterns of the modern tartan. Maybe your Joe is standing with Bonnie Prince Charie in the fields of Culloden in 1746, the last ground battle ever fought in Britain. Or maybe your Joe just wants to toss a caber at this year's Highland Games. Either way, this is the tartan you need.